It's an amazing phenomenon. One can barely sneeze in a Canadian National Park and yet somehow these monster trucks have been granted permission to drive up and down the Athabasca Glacier. Where is The Monkey Wrench Gang when we need them? Left Canmore at 4:30 yesterday morning in hopes of day tripping Mt. Columbia. For some strange reason, Josh L and Ryan C were suffering from the same delusional whimsy. So we piled in to my chariot and drove 2.5 hours up the Icefields Parkway to the Athabasca Glacier. 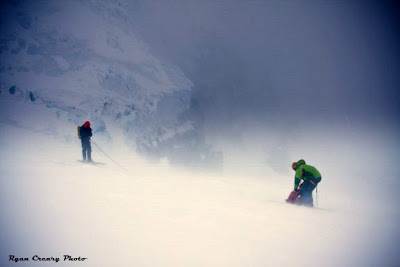 The weather wasn't ideal as we started out, but atleast it managed to hold just long enough for us to ski about 15 kms to the base of the peak. 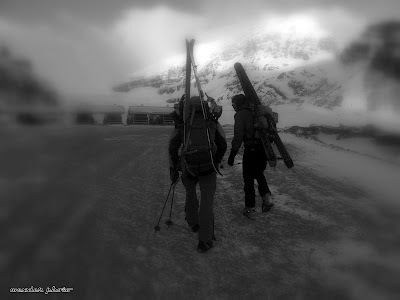 Faced with only two options (death or retreat), we chose the latter and began the slow ski out. By this point, the weather had completely socked in and we remained glued to the compass and GPS almost the entire way back. Eleven hours of skiing and zero turns. Perhaps the death option would have been the way to go, which is exactly what Josh must have been thinking when he tried to hurl himself into a crevasse in the fading light. Next time buddy! Ten minutes in and 650 more to go. Josh and Ryan sneak under the seracs on the approach to Mt. Columbia. In the Trench below Columbia and still thinking the weather might hold. Josh groping around in the white room. Good thing he charged his glow-suit! This picture would normally retail for $800 but Ryan was gracious enough to lend it to Global Alpine in exchange for a life time of shooters at Hooligans. The photo was taken near the end of the day as we were about to ski down The Ramp. Our line of descent was too far skier's right and when we went to cut left, Josh punched through a snowbridge. Well, he never really punched through because when the trap door opened beneath him, he managed to roll hard right on to solid ice and avoid taking the plunge. Author's note: Josh is actually 25% cat. Here you can see Josh standing on the ice while I futz with the rope. We eventually climbed back up a few hundred feet in order to gain the the better line of descent. What struck me about the incident was how the day went from zero to sixty in less than a nano-second . One minute we were skiing down the glacier not thirty minutes from the car, and the next minute buddy is almost in a slot, the wind is howling, the light is fading, and a situation is brewing. It's not the first time that I've seen things go south in a hurry, it's just that sometimes you forget how fast it happens.